As a certified dog trainer, I read a lot of dog training books. One particular book I bought specifically in order to get help with my dogs. 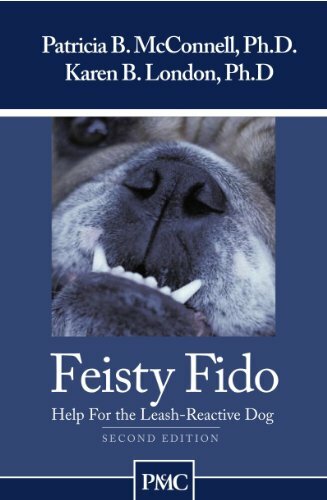 That book is called, “Feisty Fido, Help for the Leash-Reactive Dog”. My dogs, Sephi and Maya, walk pretty well on a leash until they see another dog. I struggle to keep a hold of them as they pull. Sephi is pulling because she doesn’t like other dogs and she wants to go after them. Maya is pulling because she loves other dogs and she wants to go play with them. This book has been very useful in helping me understand why my dogs are behaving this way and what I can do to correct their behavior. Check out my review of the book at the American Dog Blog. Then visit our new Dog Lover’s Book Store in order to purchase it from Amazon.com. Because I love dogs, I also read a lot of stories about dogs. I recently read a fantastic fictional story by W. Bruce Cameron titled, “A Dog’s Purpose”. This story is told from a dog’s perspective. The dog describes his different lives as a stray, as a family pet, as a working dog, and as a backyard dog. Although there were parts in this book that made me cry with sadness, there were also parts that made me cry with joy. I thoroughly enjoyed this book. You can read the review of this book at the American Dog Blog as well. And this book is also available at the Dog Lover’s Book Store. I just read “One Good Dog” – it was FANTASTIC!